You know why the Gallaghers’ always where parkers don’t you? Nah, it’s not because it’s cool (which it obviously is) it’s because in Manchester, it always, always rains. The Great Nave is one of the most spectacular spaces that I have had the pleasure of photographing, it just feels epic. With the spectacular altar that has been deliberately kept in state of semi disrepair and the beautifully restored Saints looking down from the lofty perch it really feels like you are in somewhere of great significance. Top Tip: glass balcony provides a great vantage point for your “Everybody” photograph. The venue staff have advised that this area is strictly off limits to the public so you need to make sure you get special permission. 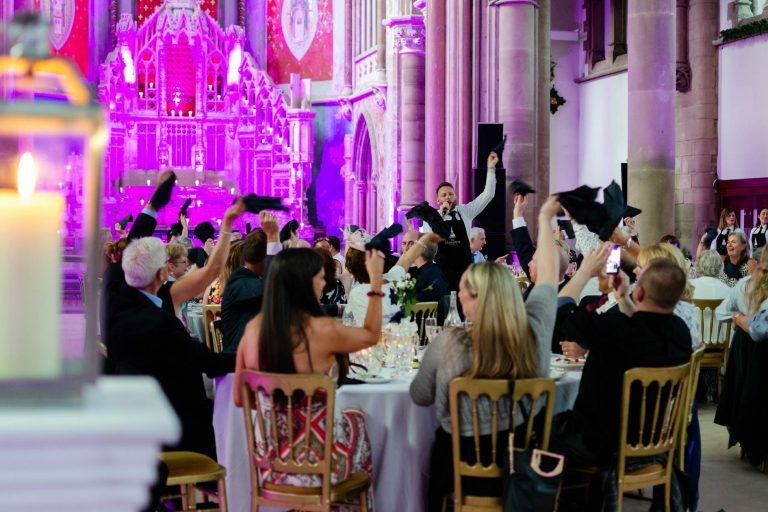 The Welcome Wing is a recent addition which provides for an excellent social area for you and your guests to congregate in while the venue staff are turning round the Great Nave for the wedding breakfast. Top tip: be careful of the lighting here – the room lights have a slight weird tinge which turns blue to green that you can barely notice with your eyes, so please check your camera settings. The Cloister Gardens are well maintained and provide a lovely setting for some informal group shots and candid moments. This is definitely the spot for when the sunshiinnnnes (sorry, couldn’t resist). On a hot evening, I especially love the fairy lights lighting up the trees. 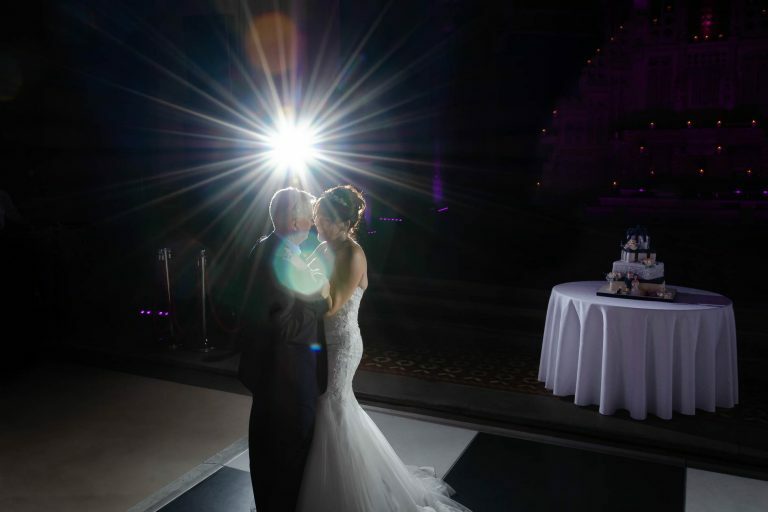 The Chancel, High Altar and Reredos, with it’s epic purple uplighting is just an amazing spot for portraits to remember. The Crucifix, this is full of religious significance if this of interest to you. The Cloister corridors have these beautiful arches running their length and make for a great spot for intimate couples’ portraits. The Victorian Pantry serves lovely afternoon tea and the Old Refectory is a very cosy space to sit and relax. The staff are lovely! After one beautiful wedding, I was daft enough to leave my Ipad in the Great Nave – the staff found it and looked after it for me until I was able to pick it up. 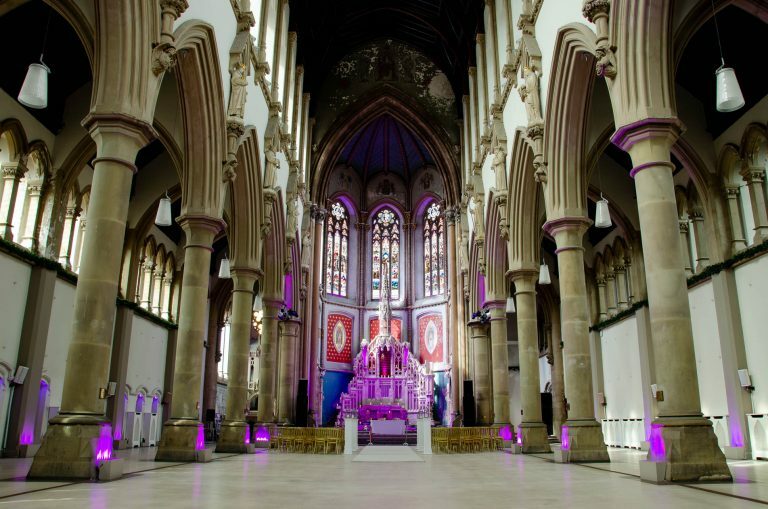 The Monastery Manchester is licensed to weddings and civil ceremonies and can accomodate parties from 50 to 500 guests. There is is ample free parking and the disabled access is well thought out. The food is great (I may have enjoyed the profiteroles a little too much last time). One thing I haven’t mentioned is the price – it’s actually really reasonable – they have last minute wedding packages available from £3,000. I don’t know of a venue this grand that offers better value than that! The Monastery Manchester is a truly beautiful venue that feels very special and has gravitas. Please just look past the location and you won’t be disappointed.